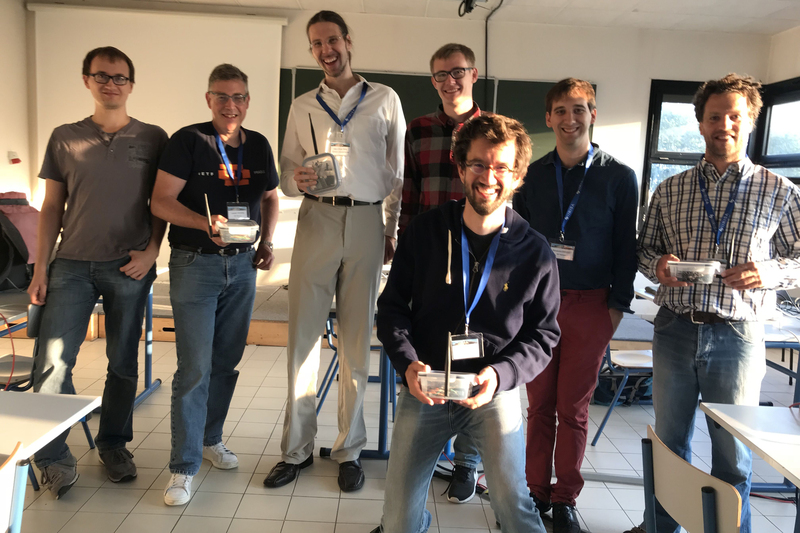 From September 4th to 7th, 2018, the Summer School on the Industrial Internet of Things (IIoT) brought together researchers and academics about one subject: how to know everything about air quality with the help of thousands of small sensors? 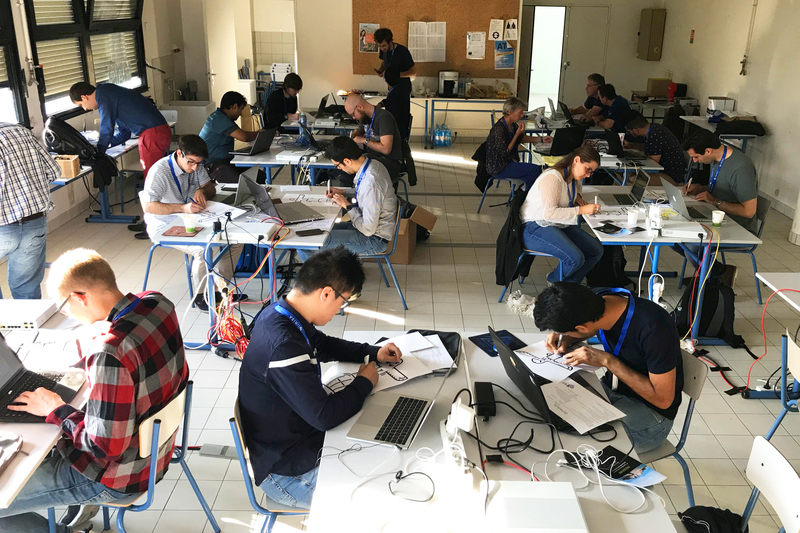 In Saint-Malo, 18 French and German Masters students, PhD students and academics came together for three days to learn more about and to work on the subjects of network connectivity, cyber security and coding for the Internet of Things. The participants learned how to use sensors, how to connect them and how to use software tools and dedicated networks for connected objects. Accompanied by around 60 researchers and attendees from all over the world, the participants of the Summer School occupied the Palais du Grand in Saint-Malo to exchange their knowledge and ideas on the topic. As many of the attendees stated, the Summer School didn’t only fulfill its pedagogical aim but also built a bond of trust and friendship between the members of the virtual German-French Academy for the Industry of the Future. Industry and civil society do not share the same expectations when it comes to connected objects. The Internet of Things (IoT) must therefore adapt to meet industrial demands. These specific adaptations have led to the emergence of a new field: IIoT, or the Industrial Internet of Things. Nicolas Montavont describes the industrial stakes that justify the specific nature of the IIoT and the challenges currently facing the scientific community. What does the IIoT look like in specific terms? Nicolas Montavont: One of the easiest examples to present and understand is the way production lines are monitored. Sensors ensure that a product is manufactured under good conditions, by controlling what travels down the conveyor belt and by measuring the temperature, humidity or luminosity for the specific work environment. Actuators can then respond to the data received, for example by reconfiguring a production line based on the environment or context, allowing a machine to perform a different task. How does the IIoT benefit companies? NM: There are benefits in every area: production times, line performance, cost reduction, etc. One major benefit is increased flexibility thanks to a more autonomous system. Production lines can operate and adapt with fewer human interventions. Staff can therefore transition from a role of handling and management to supervision and control. This change especially benefits small businesses. Today, production is very focused on large volumes. Increased flexibility and autonomy let companies find more cost-effective ways of manufacturing small quantities. What justifies referring to IIoT as a separate field, distinct from the mainstream IoT? NM: Mainstream IoT technologies are not designed to meet industry requirements. In general, when IoT is used for applications, the performance requirements are not very high. Communicating objects are used to send non-critical data packets without strict time constraints. The opposite is true for industry demands, which require object networks that send important data with the lowest possible latency. Therefore, specific IoT standards must be developed for the industrial sector, hence the name IIoT. For example, companies do not want to be limited by propriety standards, and so they want to push the Internet to become the network that supports their architectures. Why do companies have more performance constraints for their networks of communicating objects? NM: One scenario that clearly represents industrial constraints is the one we selected for the SCHEIF project, in the context of the German-French Academy for the Industry of the Future (GFA). We initiated a collaboration with the Technische Universität of Munich (TUM) on the quality of the network and data in an industrial environment. We started with a scenario featuring a set of robots that move autonomously through a work environment. They can accomplish specific tasks and can also detect and adapt to environmental changes. For example, if a person walks through the area, they must not be hit by the robots. This scenario includes a major safety aspect, which demands an efficient network, low latency, good-quality data communications and the effective assessment of the state of the environment. What are the scientific challenges of this type of example? NM: First of all, locating robots indoors in real time presents a challenge. Technologies exist but are not yet perfect and do not offer sufficient performance levels. Secondly, we need to make sure the robots exchange the monitoring data in an appropriate manner, by prioritizing the information. The main problem is, “who needs to send what, and when?” We are working on how to schedule the communications and represent the robots’ knowledge of their environment. We also have energy consumption constraints, first in terms of hardware and the network. Finally, there is a significant cybersecurity aspect, which has become a major focus area for the scientific community.